Machining of the two pony truck centres is underway as the pictures of them in the Lang lathe show. These need to be attached to the fabricated stretchers, also shown, with fitted bolts whilst the stretchers are upside down. Machining of the frame keeps has been temporarily suspended whilst we pursue this job. We are now in possession of case hardened steel bushes for the king pin holes in the radial arm support stretchers and work will progress here as soon as time permits. 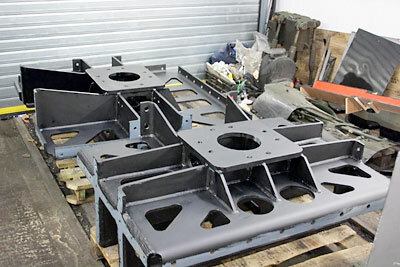 The order has been placed with our good friend Dave Hewson for the fabrication of the smokebox saddle and profiling of the steel has already begun. 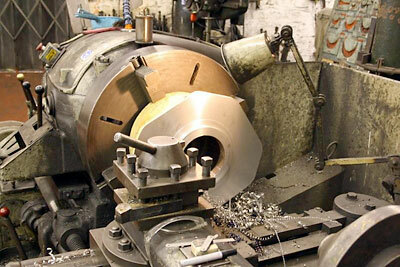 We are seeking quotations for the machining of this component as it is too big for the machines in Bridgnorth works. The prints are of excellent quality and are selling well, so if you'd like to own one of the first 10 prints of this fine limited edition portrait, please get in touch with Chris without delay. Each print is accompanied by a numbered certificate signed by the artist. 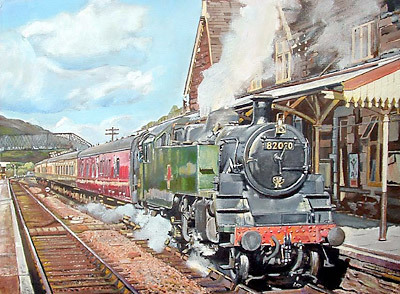 The Second Annual General Meeting of The 82045 Steam Locomotive Trust will be held at Kidderminster Railway Museum on Saturday 2nd April 2011 at 2.00 p.m. This time, the meeting is to take place in the upstairs lecture room, as the Library proved to be too small for the excellent turn-out earlier this year. All are welcome, so please try to attend: there is a great deal to talk to you about and discuss with you as the 82045 project continues to gather momentum. We will be reporting in detail on progress over the past twelve months and also outlining our plans for the future. 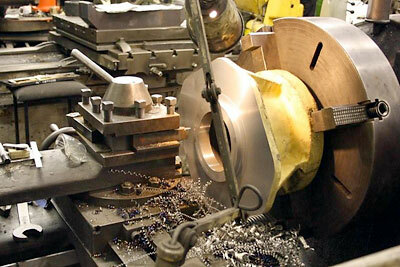 Machining of the pony truck centres in the Lang lathe. The fabricated stretchers ready to accept the pony truck centres.